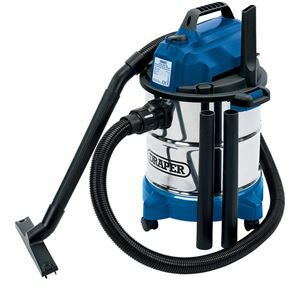 Draper 20L 1500w Wet and Dry Cylinder Vacuum Cleaner - Robust model with stainless steel tank and blower function. Designed to pick up wet and dry materials with 20L tank volume. Ideally suited for use in the workshop, garage or DIY work around the home and garden. 3.5M (approx.) cable and approved plug. 1.5M flexible hose with hand grip and air control.